The founders of interpersonal psychotherapy saw a pattern among the people they helped with mood difficulties. Their patients, they discovered, were all experiencing problems in at least one of four different areas in their lives at the time they became depressed: interpersonal conflict, life transitions, complicated grief, or social isolation. These four problem areas aren’t causes, but they are contributing factors to why people feel sad, blue, down, and depressed. At least one of them can almost always be linked to a recent depressive episode. Conflict takes many forms. It can be with a spouse about how to discipline the kids, a friend who stops calling, an aging parent who refuses to stop driving, or a sibling who manages to ruin every family gathering. Does your boss keep piling work on your desk at 5 p.m., expecting it to be done the next day? Is your teenage son or daughter so belligerent that you yell every day (and cry every night)? Is your neighbor’s behavior making you seriously consider putting your house up for sale? Your grief may be complicated because of circumstances at the time of the person’s death. For example, if you weren’t able to see your loved one before they died, if your last interaction was a fight, or you had to miss the funeral, you may be left with feelings of guilt that won’t go away. Guilt is also a common — and very intense — feeling when a loved one takes their own life. You may blame yourself for not doing enough or seeing the signs. Because of the social stigma of suicide, you may also feel that you can’t openly mourn the death and receive support for your loss. Lack of support at the time of a loved one’s death in general makes it harder to grieve someone’s death fully. 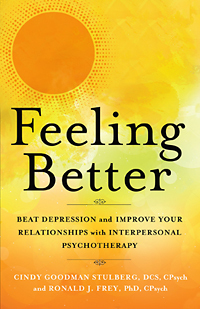 Cindy Goodman Stulberg, DCS, CPsych, and Ronald J. Frey, PhD, CPsych, are the authors of Feeling Better and directors of the Institute for Interpersonal Psychotherapy. Visit them online at www.interpersonalpsychotherapy.com. Excerpted from the book Feeling Better. Copyright © 2018 by Cindy Goodman Stulberg and Ronald J. Frey.